My good friend and ex-housemate Rob spent a few months teaching English in Sestri Levante in 2006. 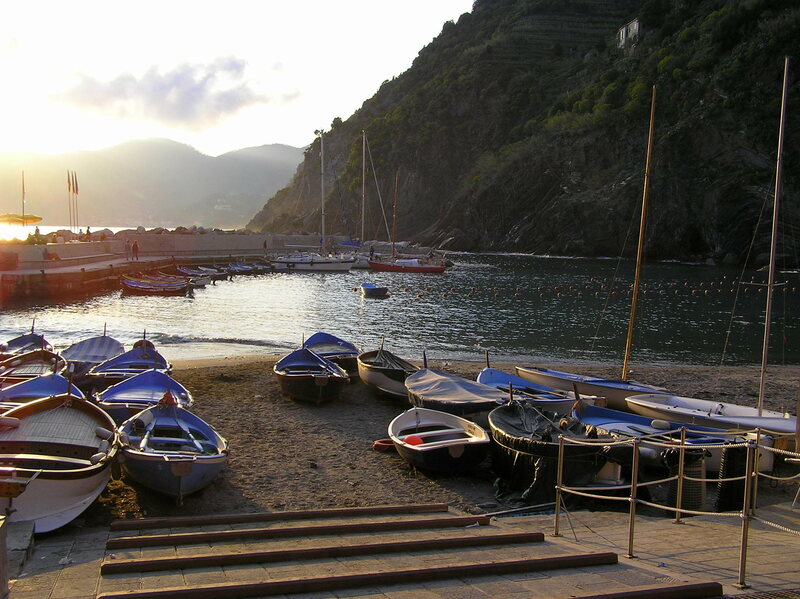 The small town in Liguria has become a favourite holiday destination for Italians, with two beaches and lots of nice restaurants, so it was pretty shrewd on his part. It’s also an area known for pesto…say no more, Nick was there. So one weekend in spring, Steph, Molly, Nick and I boarded an Easyjet flight for Genoa. I’m not entirely certain now, but I think it was my first Easyjet experience. I definitely remember thinking what a scrum it was to get on the plane and how terrible the seats were, and given that’s long since failed to surprise, I suspect I was a Stelios virgin at the time (if you excuse my mixed airlines). I also remember Steph and Molly declaring themselves fearful fliers, and being slightly bemused that Molly showed no signs of being such – chatting animatedly throughout – while Steph left fingernail marks in my hand. Having landed in Genoa, we caught a bus to the train station, negotiated the purchase of tickets – revealing our collective ignorance of the language – and travelled onward to the coast. Rob was sharing a flat on the edge of the town centre and, after picking up his keys and dropping off our stuff, we nipped to the supermarket for provisions. Nick couldn’t get over how nice the Italian tomatoes were (to become a recurring theme of our stay) and, after a delicious spread of cheeses, hams, bread, olives and fruit, we headed to the beach. Sestri has two bays: Baia delle Favole (Bay of Fables/Fairy Tales) and Baia del Silenzio (Bay of Silence) on either side of a peninsula. It was a little cloudy and only some of us had packed our swimwear, but Nick decided a dip was in order while we waited for Rob to finish work and join us. Rolling up his jeans, he waded out looking for crabs. The clothing precautions proved futile, however, as he was soon up to his waist and gave up completely when Rob joined him in the sea. We got some strange looks from the locals as we headed back to the flat more than a little sodden! 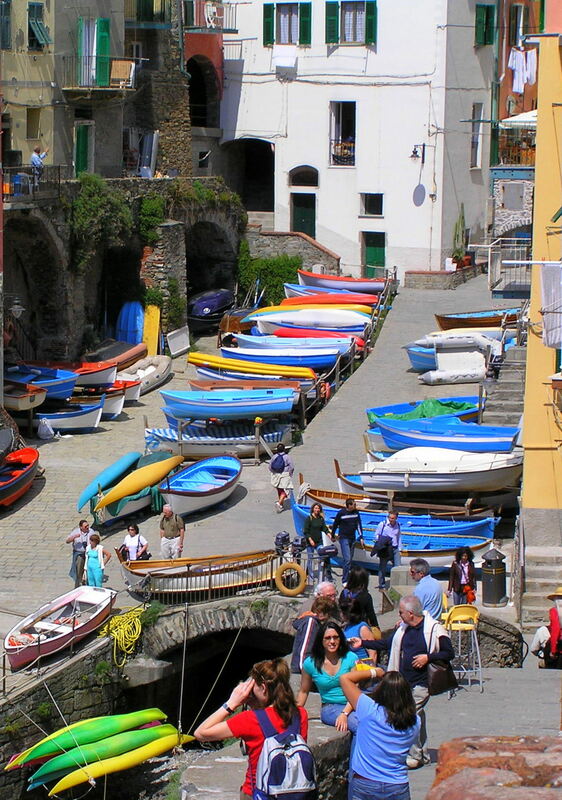 The bars and restaurants are great in Sestri. It helped, of course, that we had a temporary resident with us, who was now conversant in Italian – particularly the Italian necessary to decipher food and drink menus! We ate in a great trattoria that night – clam linguine, octopus, mussels…and pesto pasta for Nick, of course! 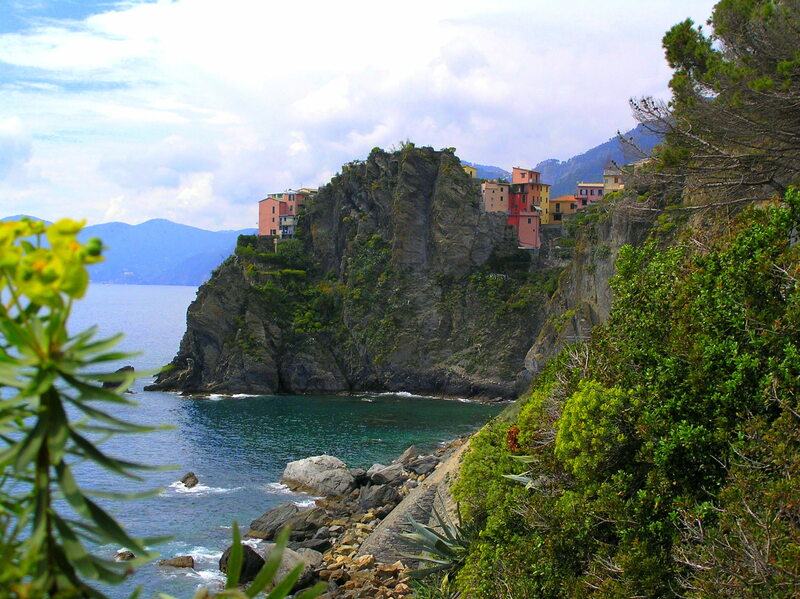 The next day we got up early and headed to Cinque Terre (‘the Five Lands’). This gorgeous stretch of coastline, with its five picture-perfect villages, was wisely set up as a protected marine area in 1998 and as a national park in 1999. It’s now a UNESCO World Heritage Site and I would recommend it to anyone in a heartbeat. We caught a train to the furthest point, the village of Riomaggiore, where we had lunch at a sweet little trattoria high above the rocky bay. Branching out, Nick had pesto lasagne. Sated, we next walked part of the Sentiero Azzurro trail connecting the five villages. 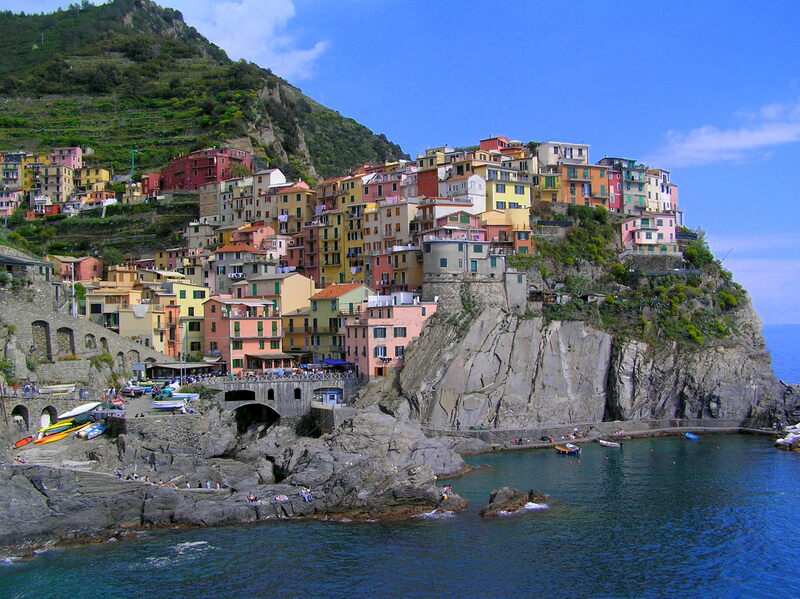 It was a hot day, but there was a nice breeze from the sea, and the walk past the second hamlet – Manarola – and onward to Corniglia, was beautiful. The trail literally winds along the edge of the cliff, with the clear blue sea below and beautiful flowers and cacti clinging to the rocks. Skipping Vernazza, we jumped back on the train to Monterosso while it was still warm and light and spent a couple of hours chilling on the beach. 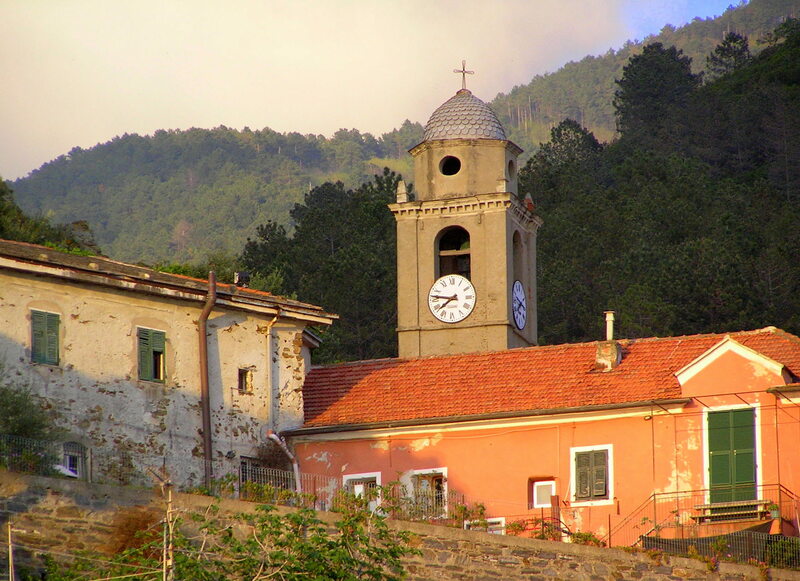 Monterosso is, in my view, the least picturesque of the five, with the train line running along its front, but it was still a great place to lie with a book and an ice-cream. The sea was warm too – a lot warmer than the day before in Sestri – and everyone had their bikinis and trunks this time! We returned to Vernazza for tea, just as the sun was starting to dip and the pretty harbour was bathed in golden light. I love that time of day, especially when you have the smell of suncream on your skin, salt in your hair, your cheeks are glowing and you’re looking forward to dinner. We ate in Belforte, a restaurant cut into the cliff, with its tables precipitously perched overlooking the sea. The food was delicious and we looked out on a stunning orange and pink sunset as we polished off our dessert. A perfect day! The Sunday was spent pottering around the shops and bars in Sestri. In the evening we ate in a great pizzeria, Steph having now learned how to pronounce the Italian for peach and thus avoiding ordering fish juice for a second time and Nick having learned how to say “definitely no anchovies”. Our trip ended with cocktails in the rooftop bar of Hotel Vis a Vis, enjoying the great views of the peninsula with the twinkling lights along the coast. Viva l‘Italia! This entry was posted in Italy, Travel and tagged Cinque Terre, Italy, Pasta, Pesto, Sea, Sestri Levante, Sun on May 3, 2013 by victoriassecretblog.